Join Us!!! We are looking for someone to help us cover Algerian basketball. Please send us an e-mail. We bring you last week's top performances from Algerians who are playing abroad and who all have had prior experience of national team duties at youth or senior level. #1. This week's number one is an experienced former international point guard Samir Mekdad (191-86, currently plays in France). He was the major contributor in a STB Le Havre's victory against the third-ranked JSA Bordeaux (11-7) 82-76 in the French NM1 (third division) in Friday night's game. Mekdad recorded 14 points, 4 rebounds and 6 assists in 29 minutes on the court. It was the game of the round between two top 3 ranked teams in Group B. STB Le Havre (11-6) is placed second. It was his team's third consecutive victory in a row. Mekdad has relatively good stats this year: 11.6ppg, 2.9rpg, 3.4apg, 2FGP: 41.7%, 3FGP: 37.7% and FT: 69.1% in 16 games he played so far. He has a dual citizenship: Algerian and French. Mekdad played for the Algerian senior national team two years ago. #2. Second place goes to former international power forward Mehdi Cheriet (204-87, college: San Diego St., currently plays in France). He led SO Maritime Boulogne to an easy victory against the 13th-ranked Aubenas (4-15) crushing them 81-57 in the French NM1 (third division) last Saturday. Cheriet recorded 12 points and grabbed 4 rebounds. SO Maritime Boulogne (11-8) is placed fourth in Group A. It was his team's sixth consecutive victory in a row. This season Cheriet averages: 8.2ppg, 3.4rpg, 1.4apg, 2FGP: 55.0%, 3FGP: 35.6% and FT: 66.7%. He is another player who holds two passports: Algerian and French. Despite Cheriet played previously for the French U20 national team, he played also for the Algerian national team in 2017. #3. The Algerian player who performed third best last week abroad was former international forward Mohamed Harath (198-90, currently plays in Qatar). Harath led Al Shamal to a victory over the league outsider Al Rayyan (1-9) 86-74 in a derby game in the Qatari D1 on Tuesday night. He was MVP of the game. Harath had a double-double by scoring 27 points and getting 18 rebounds. He also added 4 assists in 40 minutes. Al Shamal Doha (8-2) is placed first in the D1. It was his team's sixth consecutive victory in a row. The Regular Season already ended. Harath has individually a very good year with high stats. He averages: 27.0ppg, 17.7rpg, 3.8apg, 1.6spg, 2FGP: 53.8%, 3FGP: 26.9% and FT: 75.9% in nine games. Former Groupe Sportif Petroliers Alger starter played for the Algerian national team two years ago. #4. 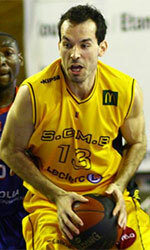 Shooting guard Karim Atamna (196-80, currently plays in France). Atamna could not help Aix-Maurienne (6-9) to beat Quimper UJAP (5-9). He scored 9 points and grabbed 7 rebounds. But Aix-Maurienne was defeated 65-57 on the road by the lower-ranked Quimper UJAP (#16). It was Aix-Maurienne's fourth consecutive loss in a row. It's Atamna's fourth season with the team. Atamna's overall stats this year are: 7.5ppg, 3.6rpg and 2.3apg. He has both Algerian and French nationalities. Atamna used to play for the Algerian national team back in 2007. #5. Former international guard Faycal Sahraoui (186-79, currently plays in France) was not able to help La Rochelle in their game against Union Tours (10-9) in the French NM1 (third division). He recorded 6 points and added 8 assists in 38 minutes. The tenth-placed La Rochelle (9-10) lost 77-87 in Tours to the higher-ranked (#7) Union in the Group B. Sahraoui is one of the most experienced players in a team as it's his eighth year in La Rochelle's roster. This season Sahraoui has relatively solid stats: 12.8ppg, 3.4rpg, 6.0apg and 1.2spg in 19 games. He also holds two passports: Algerian and French. Sahraoui used to play for the Algerian national team four years ago. #1. Chej Ainatu (191-G/F-91, currently plays in Spain) managed to help Megacalzado Ardoi to win against the 13th-ranked Ordizia-Basoa (2-11) 78-63 in the Spanish EBA (fourth division) on Sunday night. He recorded 5 points. Megacalzado Ardoi (12-1) is placed second in Group A-A. It was his team's tenth consecutive victory in a row. It's Ainatu's first season with the team. Ainatu's overall stats this year are: 8.1ppg, 1.7rpg and 1.7apg. Here is the weekly review of the top performing Algerian players, who play currently abroad. #1. This week's number one is former international forward Mohamed Harath (198-90, currently plays in Qatar). He led Al Shamal to a 3-point victory over the closely-ranked Al Arabi (10-6) 80-77 in a derby game in the Qatari D1 in Saturday night's game. Harath was MVP of the game. He had a double-double by scoring 25 points and getting 21 rebounds. Harath also added 4 assists in 40 minutes on the court. It was the game of the round between two top 4 ranked teams. Al Shamal Doha (12-4) is placed second in the D1. Harath has individually a very good year with high stats. He averages: 24.1ppg, 17.2rpg, 3.9apg, 1.3spg, 2FGP: 54.1%, 3FGP: 27.9% and FT: 72.5% in 17 games he played so far. Former Groupe Sportif Petroliers Alger starter played for the Algerian senior national team two years ago. #2. Second place goes to an experienced former international point guard Samir Mekdad (191-86, currently plays in France). Mekdad was the major contributor in a 1-point STB Le Havre's victory against the eighth-ranked Lorient (12-13) 65-64 in the French NM1 (third division) last Saturday. He scored 12 points, grabbed 4 rebounds and dished 4 assists. STB Le Havre (17-7) is placed second in Group B. It was his team's sixth consecutive victory in a row. The Regular Season already ended. Mekdad has relatively good stats this season: 10.7ppg, 3.0rpg, 3.1apg, 2FGP: 42.5%, 3FGP: 33.9% and FT: 65.7%. He has a dual citizenship: Algerian and French. Mekdad played for the Algerian national team in 2017. #3. The Algerian player who performed third best last week abroad was former international power forward Mehdi Cheriet (204-87, college: San Diego St., currently plays in France). He led SO Maritime Boulogne to an easy victory against the 11th-ranked GET Vosges (9-17) crushing them 112-88 in the French NM1 (third division) on Saturday night. Cheriet scored 12 points in 20 minutes. SO Maritime Boulogne (17-9) is placed fourth in Group A. The Regular Season already ended. This year Cheriet's overall stats are: 9.0ppg, 3.2rpg, 1.2apg, 2FGP: 58.2%(64-110), 3FGP: 40.7% and FT: 66.7% in 25 games. He is another player who holds two passports: Algerian and French. Despite Cheriet played previously for the French U20 national team, he played also for the Algerian national team in 2017. #4. Guard Faycal Sahraoui (186-79, currently plays in France) contributed to an easy victory against the 14th-ranked CFBB (0-24) crushing them 83-60 in the French NM1 (third division) in Saturday night's game. Sahraoui scored 8 points and added 10 passes. Stade Rochelais Basket (12-13) is placed tenth in Group B. The Regular Season already ended. It's Sahraoui's eighth season with the team. This year he has relatively solid stats: 12.4ppg, 3.2rpg, 6.2apg and 1.1spg. Similarly like Cheriet and Mekdad above Sahraoui has both Algerian and French nationalities. He used to play for the Algerian national team back in 2015. #5. Former international shooting guard Karim Atamna (196-80, currently plays in France). Atamna could not help Aix-Maurienne (6-15) to beat Gries/Oberhoffen (12-9). He scored 6 points and added 5 passes in 28 minutes. Aix-Maurienne was badly defeated 92-76 on the road by the much higher-ranked (#7) Gries/Oberhoffen. It was Aix-Maurienne's tenth consecutive loss in a row. Atamna is one of the most experienced players in a team as it's his fourth year in Aix-Maurienne's roster. This season Atamna's total stats are: 7.3ppg, 3.5rpg and 2.8apg in 21 games. Similarly like three previous players above, he also holds two passports: Algerian and French. Atamna used to play for the Algerian national team twelve years ago. #1. Chej Ainatu (191-G/F-91, currently plays in Spain) managed to help Megacalzado Ardoi to win against the 11th-ranked Goierri (5-15) 87-72 in the Spanish EBA (fourth division) on Sunday night. He scored only 2 points. Megacalzado Ardoi (18-2) is placed first in Group A-A. It was his team's sixth consecutive victory in a row. Ainatu has averaged so far 8.0ppg, 1.9rpg and 1.5apg. The most exciting game of round 16 in the D1 took place in B.B. Arreridj. This derby game ended with only one-point home defeat of 5th ranked IRB Arreridj (12-5) to eighth ranked USM Alger (8-8) 62-61 on Wednesday evening. USM Alger moved-up to seventh place. IRB Arreridj at the other side keeps the fifth position with five games lost. The game between Top Four teams took place in Staoueli. One of their biggest challengers host Staoueli (12-4) lost to third ranked GS Petroliers (13-2) 95-82. It ended at the same time the nine-game winning streak of Staoueli. GS Petroliers have an impressive 13-game winning streak. Defending champion maintains third position with 13-2 record having four points less than leader WO Boufarik. Staoueli at the other side keeps the fourth place with four games lost. Bottom-ranked Olympi Batna managed to get a third victory, breaking the four-game losing streak on Wednesday night. This time they won against thirteenth-ranked Rouiba CB 83-65. It's especially surprising that the victory came too easily and 18-point difference proves that Olympi Batna was well-prepared to that game. Olympi Batna (3-14) moved-up to fourteenth place. Newly promoted Rouiba CB keeps the thirteenth position with 11 games lost. D1 top team - WO Boufarik (16-0) had no problems winning another game. This time they crushed fifteenth ranked AB Skikda (2-14) 102-80. Undefeated WO Boufarik have an impressive 14-game winning streak. They maintain first position with 16-0 record. AB Skikda lost sixth consecutive game. Newly promoted team dropped to the bottom place with 14 games lost. An interesting game took place in Setif where higher ranked USS (8-9) was upset on its own court by eleventh ranked Olympi Miliana (7-10) 61-50 on Wednesday. Olympi Miliana moved-up to tenth place. Loser USS dropped to the eighth position with nine games lost. There were no shocking results in the other games in round 16: El Eulma lost to CRB Dar El-B. on the opponent's court 59-66. NAH Dey managed to outperform Ouargla in a home game 84-72. OS Arreridj was rolled over USM Blida on the road 67-47. D1 top team - WO Boufarik (16-0) had no problems winning another game. This time they crushed fifteenth ranked AB Skikda (2-14) 102-80. WO Boufarik have an impressive 14-game winning streak. They maintain first position with 16-0 record. AB Skikda lost sixth consecutive game. Newly promoted team dropped to the bottom place with 14 games lost. Very expected game in El-Beida where 12th ranked El Eulma (5-10) was defeated by sixth ranked CRB Dar El-B. (9-7) 66-59 on Wednesday. CRB Dar El-B. have an impressive five-game winning streak. They maintain sixth position with 9-7 record. Loser El Eulma keeps the twelfth place with ten games lost. Very predictable result in Alger where second ranked NAH Dey (14-3) defeated 14th ranked Ouargla (2-12) 84-72 on Wednesday. NAH Dey maintains second position with 14-3 record having just one point less than leader WO Boufarik. Ouargla lost ninth consecutive game. They dropped to the fifteenth place with 12 games lost. The game between closely ranked teams ended with 10th ranked OS Arreridj's (6-9) road loss to ninth ranked USMB (8-9) 47-67 on Wednesday. USMB moved-up to eighth place, which they share with US Setif. Loser OS Arreridj dropped to the eleventh position with nine games lost. The fans could enjoy quite many interesting games in the last round. The round ended with favorites losing the games and games ending by tiny margin. Here is the last round review presented by ESL. The game between second ranked NAH Dey (13-3) and eighth ranked USM Alger (7-8) was the most important one in the last round on Sunday night. NAH Dey was defeated by USM Alger in Alger 62-77. It ended at the same time the two-game winning streak of NAH Dey. USM Alger maintains eighth place with 7-8 record. NAH Dey at the other side keeps the second position with three games lost. Very important is a road loss of third ranked IRB Arreridj (12-4) against eleventh ranked OS Arreridj (6-8) on Sunday night. Visiting IRB Arreridj was defeated by OS Arreridj in 66-49. It ended at the same time the three-game winning streak of IRB Arreridj. OS Arreridj moved-up to tenth place. IRB Arreridj at the other side dropped to the fifth position with four games lost. D1 top team - WO Boufarik (15-0) added another victory to their record on Sunday. This time they beat ninth ranked Olympi Miliana (6-10) 65-59. Undefeated WO Boufarik have an impressive series of thirteen victories in a row. They maintain first place with 15-0 record. Olympi Miliana lost third consecutive game. They dropped to the eleventh position with ten games lost. A very interesting game took place in Eleulma. It ended with only two-point defeat on the road of higher ranked USS (8-8) to thirteenth ranked El Eulma (5-9) 74-72 on Sunday evening. It ended at the same time the two-game winning streak of USS. El Eulma moved-up to twelfth place. USS at the other side dropped to the seventh position with eight games lost. Sixteenth-ranked Olympi Batna (2-14) used its home court advantage to challenge tenth ranked USMB (7-9) on Sunday. The visitors from Blida managed to secure only three-point victory 79-76. However their fans expected much easier game. USMB moved-up to ninth place. Olympi Batna lost their fourth game in a row. They stay at the bottom position with 14 games lost. There were no big surprises in other games of round 15: CRB Dar El-B. beat Ouargla on the road 67-57. AB Skikda lost to Staoueli on its own court 74-79. GS Petroliers outscored Rouiba CB in Alger 82-55. No shocking result in a game when seventh ranked CRB Dar El-B. (8-7) beat on the road 14th ranked Ouargla (2-11) 67-57 on Sunday. The victory was the fourth consecutive win for CRB Dar El-B.. They moved-up to sixth place. Ouargla lost their eighth game in a row. They keep the fourteenth position with 11 games lost. Very expected game when 15th ranked AB Skikda (2-13) lost at home to fifth ranked Staoueli (12-3) 79-74 on Sunday. The victory was the ninth consecutive win for Staoueli. They moved-up to fourth place. AB Skikda lost their fifth game in a row. Newly promoted team keeps the fifteenth position with 13 games lost. Very predictable result when fourth ranked GS Petroliers (12-2) rolled over on the road 12th ranked Rouiba CB (5-10) 82-55 on Sunday. The victory was the twelfth consecutive win for GS Petroliers. Defending champion moved-up to third place. Newly promoted Rouiba CB dropped to the thirteenth position with ten games lost. D1 top team - WO Boufarik (15-0) added another victory to their record on Sunday. This time they beat ninth ranked Olympi Miliana (6-10) 65-59. WO Boufarik have an impressive series of thirteen victories in a row. They maintain first place with 15-0 record. Olympi Miliana lost third consecutive game. They dropped to the eleventh position with ten games lost.